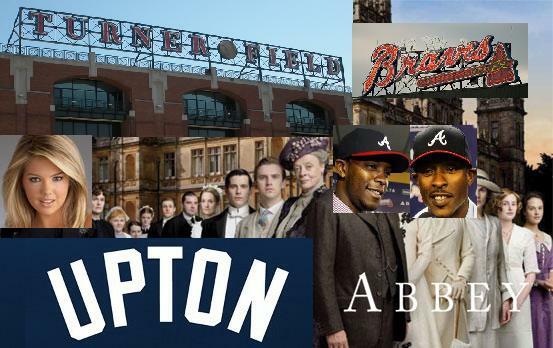 In addition to an ongoing feature on the Detroit Tigers– this year entitled Bay of Cigs— this season, with opening day at hand, it’s time to reveal a second series, Upton Abbey, to cover the Atlanta Braves. Just as the 2013 edition of the Tigers feature started with a look at those who had left the team, this series begins with one of the most notable departures in franchise history, Chipper Jones, who retired after his nineteenth MLB season, all with the Braves. Jones did not initially comment on the Yankees’ indirect overture, but sources close to him insist that he wants to keep the number of teams in his life low and the number of women high. In other personnel news, a departed Tiger is a Barve arrival: Gerald Laird will be Atlanta’s backup catcher this year, and after watching him in Detroit last season, I’m naming him front-runner for my favorite Bravo. No joke: The Braves open the season tonight at home, where they’ll host Philadelphia for a three-game set. Expectations for the season are fairly high, even with the hated Nationals looking set to make another playoff run from their division. Jonathan Bernhardt has Atlanta as a wild card team, and Jonah Keri generally seems to agree. This entry was posted in ALDLAND and tagged atlanta, braves, brian cashman, chipper jones, detroit, gerald laird, mlb, tigers by AD. Bookmark the permalink.